Puybaret, I hope I haven't asked for too much, but I do want to say that having the light frame disappear when not selected is very hard to work with sometimes. I do alot of my scenes with lights, and as you can tell by some of the renders I did, lights are very important to my designing. Sometimes I need to be able to line them up, and it is hard to do when they disappear. I was so happy when db4tech made the first light frames, because it made it so much easier to place the lights exactly the first time. Please consider making it a choice to have the light frames visible all the time? I appreciate your work on this free software, and think it's a great program! Also, maybe a choice whether or not the sun is on? Now that transparent textures are fixed, and with more outside foliage, the sun casting such strong shadows at night time makes for some unrealistic renders. But I can understand the reasoning you gave for having the sun on..
You're incredibly productive with almost daily new releases and new features!! - Part of base plan - that locks a model to the ground and makes it unchangeable when the floorplan is locked. Great too!! Hans, you're right, I just released the version 3.0 Beta 9 with new features that you requested. 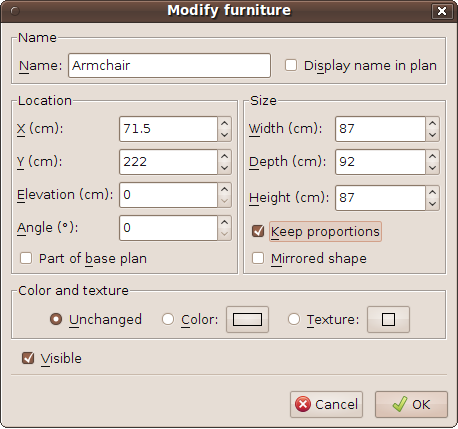 - When the Keep proportions check box is selected, width, depth and height are updated proportionally. 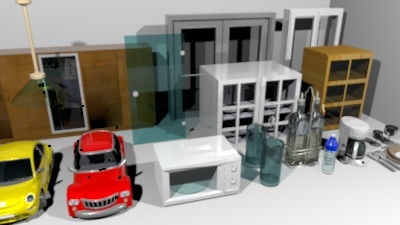 - A selected Part of base plan check box means that a piece of furniture will be considered as an item belonging to the base plan when locked and then won't be selectable (this new check box can't be unselected for doors and windows on purpose). This new option was discussed with Hans in this discussion. This new option has an other side effect on locked plans too. 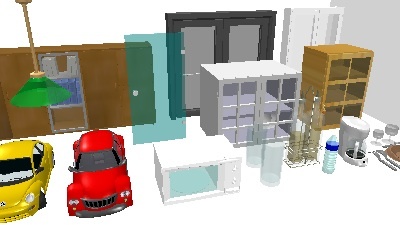 From this version, all doors, windows and not movable furniture is considered to be part of the base plan (before only doors and windows were taken into account). - I also improved color transparency rendering again for the 2 best qualities. Read my answer to db4tech below for more information. Hmmm after doing some tests, still not bright enough at 100%. Actually it's funny that you make that second point, with you not knowing a feature I've already added to version 1.6.2! Unless, you really have a very convincing proposal that would make me change my mind, I don't think I'll change it again (and it would oblige every beta tester to reset again their light power settings). There has been no misunderstanding so far about that feature added to 1.6.1. The advanced rendering plug-in is used by... advanced users, who generally don't mind some more difficult concepts. I've been giving this some further thought, all other 3D applications (that I can think of) don't hide the lights place holder, when the lights aren't selected? The other 3D applications like AOI or Blender don't target the same kind of audience, and don't offer a printing function, so it's not that much comparable. All I ask is for a preference option to let a user choose, so they can make their own decision. 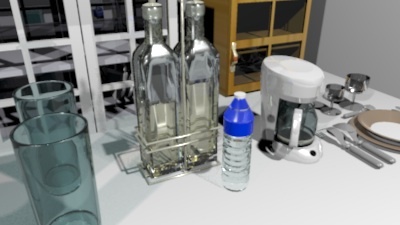 [...] To my eyes the original glass colour (as seen in 1.6.1 render) is the most accurate to real life so far, and fairly closely matches OpenGL 3D and DirectX previews. Obviously this will vary slightly for people viewing this thread on uncalibrated screens. Also, maybe a choice whether or not the sun is on? Now that transparent textures are fixed, and with more outside foliage, the sun casting such strong shadows at night time makes for some unrealistic renders. But I can understand the reasoning you gave for having the sun on. There's no sun light at night, so your problem must come from something else. - Does Matte should be spelled "Matt" or "Matte" in English? 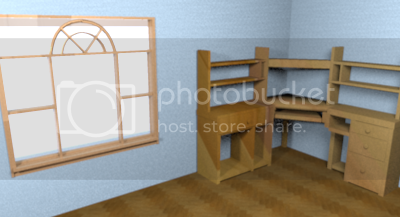 - I really would like to add support for horizontal/vertical move of selected items + proportional resizing of the selected piece of furniture with the mouse. Most drawing software let the user perform this operation with the Shift key pressed, but in Sweet Home 3D the Shift key is reserved to temporarily toggle magnetism. At this time, as version 3.0 will be a major version change, I wouldn't mind to introduce a little incompatibility in the mouse behavior compared to previous versions. My idea is to change the toggle magnetism short cut from the Shift key to Ctrl+Shift keys (or alt+Shift under Mac OS X), and use the Shift key for horizontal/vertical move + proportional resizing, instead of keeping the current Shift key and use Ctrl+Shift keys for the new behaviors. What is your mind about this proposal (don't forget unadvanced users)? Puybaret, Thanks for your answer. And maybe what I am seeing is only a difference of tweaks made between the two renderers. I only have time to show a very small sample of what I see as sun shadows unfortunately, but maybe it will give you an idea of what I see. It is a subtle difference, and I might be making a mountain out of a mole hill, and I do apologize if I am. The files are as close to the same as I could get. And I do have to say I am very happy and pleased at the Sunflow ability now to handle transparent textures, and thank you for adding this into SH3D. Almost all my trees have them. I have yet to test the latest beta. Been kinda busy lately. I am eager to check it out though! Matte or glossy option for walls is really interesting. Is it possible to integrate it on the furniture? The interest would be to choose a color or texture of the furniture in SH3D and have a look painted or not. L'option mat ou brillant pour les murs est vraiment intéressante. Est il possible d'intégrer cette option sur le mobilier? L'intérêt serait de pouvoir choisir une couleur ou une texture du meuble dans SH3D et d'avoir un aspect laqué ou non. Autre sujet. Est il possible de pouvoir verrouiller le plan de base, qui empêche ainsi une mauvaise manipulation accidentel tout en laissant la possibilité d'avoir accès aux paramètres d'un mur ou d'un objet, sans avoir besoin de déverrouiller?